But hey. I’m an adult. And I know how to avoid a sunburn. Cover up or slather up. Neither of which I could be bothered with. When I finally came inside the house, (against my will), I turned my back to DH and asked him to assess the damage. I could already feel it. You know what he did? It’s pretty much not funny, because I did real damage to my skin, and messing around with sun exposure is no laughing matter. I intend to be a healthy old Centenarian, and working with a sunburn is not the fast-track for getting me there. So what’s a girl to do now? Start the repair process. I whipped this up super quick while the kiddos were in the bath– washing off their sunscreen. Shake well before use to distribute oils. Spritz often onto affected area. I noticed that it stings a tiny bit at first, but then dissipates. It’s worth it to me to have some relief from the burning sensation of my inflamed skin while expediting the healing. Note: I get my glass bottles here. Any sized glass bottle (with a sprayer/mister top) can be used. Just formulate the recipe using the Simpler’s Method of equal parts. Easy peasy. And I’m all about riggin’ it up, makin’ it work, and usin’ what ya have. If you have no spray top and a sweet burn, why not pour this over it. Get creative–and get healed. Witch Hazel, Hamamelis Virginiana — An old folk remedy with a plethora of uses, witch hazel is derived from a plant in which the bark, leaves and twigs are used to obtain the remedy. Witch Hazel has tannins and oils that are excellent for damaged skin, mainly to relieve inflammation and to draw tissue together. It has many other uses in first aid from diarrhea to bleeding, but for our purposes, it soothes sun damaged skin amazingly! An alcohol-free version is important, because well, adding insult to injury doesn’t seem wise, and I prefer Thayer’s brand because it is not distilled; therefore maintaining the highest concentration of the therapeutic tannins. Check out my blog post on the amazing and numerous benefits of Apple Cider Vinegar here. Essential Oils– Little powerhouses; one drop of oil goes a long way. Lavender to help repair the skin and peppermint to cool it. Plus, they complement cover-up the vinegar aroma quite well. For more detailed info on the amazing benefits of lavender (lavandula angustifolia), I have blogged about it here. Also, the recipe given in that post is excellent for burns as well. 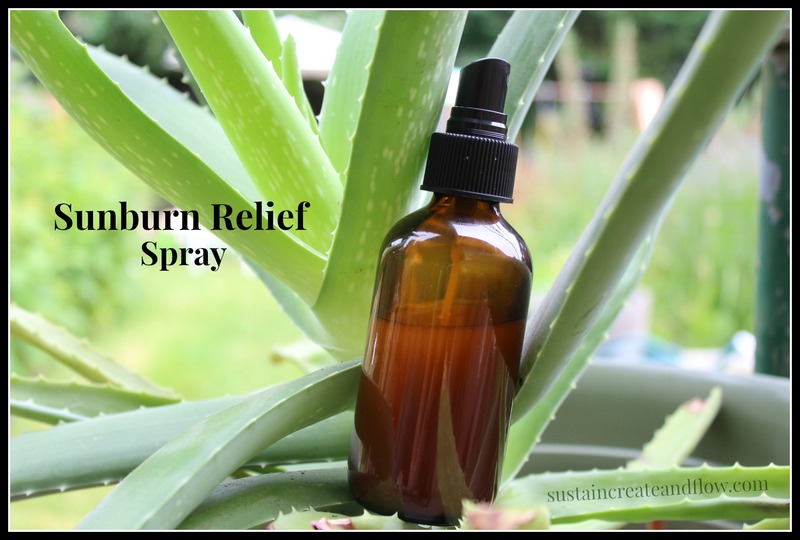 There are many ways to treat a sunburn naturally. Slather on some aloe and go dig in your cupboard. 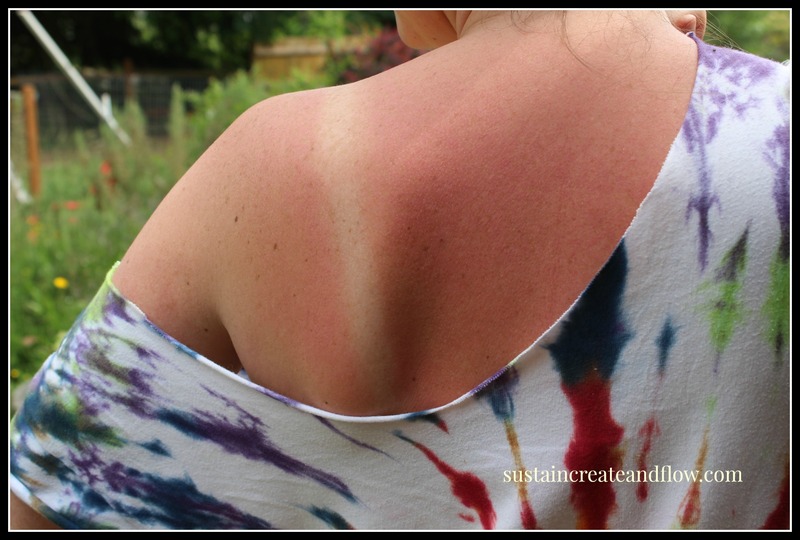 These two articles give great tips on how to treat a sunburn naturally.